For other uses, see Nièvre (disambiguation). Nièvre is a department in the centre of France, in the Bourgogne-Franche-Comté region. It is named after the Nièvre river, a tributary of the Loire. Its prefecture and largest city is Nevers. Nièvre is one of the original 83 departments created during the French Revolution on 4 March 1790 with Nevers as its capital. It was formed from part of the old province of Nivernais and its name was written at first as Nyèvre. It was divided in nine districts: Nevers, Saint-Pierre-le-Moutier, Decize, Moulins-Engilbert, Château-Chinon, Corbigny, Clamecy, Cosne and La Charité. In 1800, with the creation of the arrondissements in France, the nine districts were changed into four arrondissements: Nevers, Château-Chinon, Clamecy and Cosne. On 10 September 1926, the arrondissement of Cosne was eliminated but in 1943 it became again an arrondissement of the department. Nièvre is part of the Bourgogne-Franche-Comté region. It has an area of 6,816.7 km2 (2,632 sq mi). The highest point of the department is Mont Préneley (46°57′24″N 4°0′7″E﻿ / ﻿46.95667°N 4.00194°E﻿ / 46.95667; 4.00194﻿ (Mont Préneley)), 855 m (2,805 ft) high; it is in the commune Glux-en-Glenne. Eastern zone, with small hills covered with forests; here is the Parc Naturel Régional du Morvan ("Morvan regional natural park"). Central zone, an agricultural zone. Western zone, a zone organised along a north-south line formed by the valley of the Loire river; it is the zone of the department with higher population. The main rivers in the department are the Loire, that makes most of the western border, with its tributaries Allier and Aron; and the Yonne, with its tributary Cure. The Köppen climate classification type for the climate at Nevers is an "Oceanic climate" (also known as Maritime Temperate climate) and of the subtype "Cfb". It rains in all seasons but precipitations are more important in the eastern zone, in the Morvan, and weaker in the Loire valley. 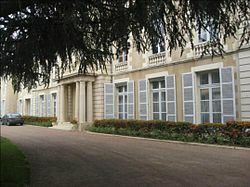 Nièvre is managed by the Departmental Council of Nièvre in Nevers. The department is part of the Bourgogne-Franche-Comté region. There are 4 arrondissements (districts), 17 cantons and 309 communes (municipalities) in Nièvre. The inhabitants of Nièvre are known, in French, as Nivernais (women: Nivernaises). Nièvre had a population, in 2014, of 213,569, for a population density of 31.3 inhabitants/km2. The arrondissement of Nevers, with 118,087 inhabitants, is the arrondissement with more inhabitants. ↑ "Le Président du Conseil Départemental" (in French). Conseil Départemental de la Nièvre. Retrieved 10 June 2017. ↑ 2.0 2.1 "Département de la Nièvre (58)". Comparateur de territoire (in French). Institut national de la statistique et des études économiques - INSEE. Retrieved 10 June 2017. ↑ 3.0 3.1 "Populations légales 2014: Recensement de la population - Régions, départements, arrondissements, cantons et communes" (in French). Institut national de la statistique et des études économiques - INSEE. Retrieved 10 June 2017. ↑ "Description de la Nièvre". Le SPLAF (in French). Retrieved 5 October 2014. ↑ 5.0 5.1 "Historique de la Nièvre". Le SPLAF (in French). Retrieved 5 October 2014. ↑ "Mont Préneley, France". Peakbagger.com. Retrieved 10 June 2017. ↑ "Situation géographique de la Nièvre". CG58.fr. Conseil Général de la Nièvre. Retrieved 5 October 2014. ↑ "Nevers, France - Köppen Climate Classification". Weatherbase. Retrieved 5 October 2014. ↑ "Chiffres-Clés". CG58.fr. Conseil Général de la Nièvre. Retrieved 5 October 2014. ↑ "Département de la Nièvre (58)". Géographie administrative et d'étude (in French). Institut national de la statistique et des études économiques - INSEE. Retrieved 10 June 2017. ↑ 11.0 11.1 11.2 11.3 "Régions, départements, arrondissements, cantons et communes" (PDF). Populations légales 2014 (in French). Institut national de la statistique et des études économiques - INSEE. Retrieved 10 June 2017. ↑ "Département de la Nièvre (58)". Comparateur de territoire (in French). Institut national de la statistique et des études économiques - INSEE. Retrieved 10 June 2017. ↑ "Décret n° 2014-184 du 18 février 2014 portant délimitation des cantons dans le département de la Nièvre" (in French). Legifrance.gouv.fr. 18 February 2014. Retrieved 30 April 2015. ↑ "Nièvre (58)" (in French). habitants.fr. Retrieved 6 October 2014. Wikimedia Commons has media related to Nièvre. This page was last changed on 12 September 2018, at 07:56.